The Karasawa Cirque is surrounded by the towering peaks of Mt. Oku-Hotakadake and Mt. Kita-Hotaka in the Northern Japanese Alps. The glacial-eroded cirque has diameter of 2 kilometres, sits at an altitude of 2,300 metres and is a 5 to 6-hour hike from the Kamikochi bus terminal. 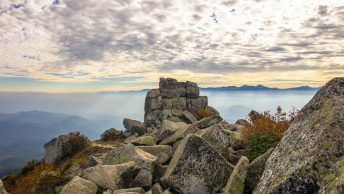 Long been a base for climbing some of Japan’s tallest and most rugged peaks it comes into its own during the autumn and is rightly regarded as one of the top places in Japan to watch the changing autumn colours. Did I mention popular? In years past I ridiculed the sight of hundreds of multi-coloured tents packed in so tightly as to squeeze the enjoyment from even from the most seasoned camper. I felt it was the antithesis of what getting back to nature was all about and I swore I’d sooner hang up my boots then partake in such mountain madness. Then again maybe they were onto a good thing and as they say if you can’t beat them, join them. So, with a perfect weather forecast last weekend combined with height of the foliage season I decided to hike up and see the spectacle for myself. Officially the campsite at Karasawa has around 500 designated tent sites, unofficially like the two mountain lodges that border the cirque it will never turn away a weary traveller while spaces remain vacant which means housing over 1,000 tents is a distinct possibility on busy weekends. Thankfully I had the good sense to arrive by 11 am before all the better spots had been devoured. By mid-afternoon you had work cut out mustering anything close to a level surface on the rock and stone and arriving after that meant either camping out on a snow field or in some far-flung corner. 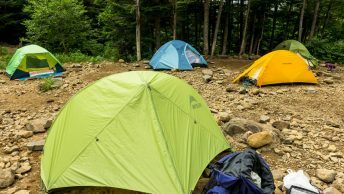 It goes without saying that the downside of living in such close quarters means simple things like trips to the restroom can be time-consuming and an early morning start on the trail is virtually mandatory to avoid being caught in endless bottlenecks. On the plus side it’s a friendly and festive atmosphere where the beer flows and while it maybe not be to everyone’s taste, the views from mountaintops on a crisp clear autumn morning are simply breathtaking. First view of the Karasawa Cirque with Mt. Oku-Hotakadake in the backdrop. Enjoying the fine autumn weather. Trudging onwards and upwards to the Karasawa Hutte. Tents pitched on rock and stone. By mid afternoon it was getting pretty packed in. Now where did I pitch my tent again? Tents lit up at nightfall. Waking up to another glorious autumn day. View from the Hotaka-dake hut at 3,000 m.
Fantastic! Haven’t seen anything like this before. Neither had I, you really have to see it for yourself to understand how jam-packed it can get at Karasawa. Though next time I’d definitely pick a less busy time to visit. So the next question is, what would be the optimal time to go? The main reason for going there is to see the autumn leaves – right? Are you thinking a mid-week trip? If you want to avoid the peak crowds, it’s best to visit mid-week. The optimal time to view the autumn leaves at Karasawa is early October.